Are you a crochet lover like me? Do you enjoy being around others who love to crochet, also? Then you won’t want to miss the CGOA Conference in Reno next month. It will be held at the Grand Sierra Resort from Sept. 12-16. There are many wonderful crochet (and knit) classes being offered. Go to http://www.knitandcrochetshow.com/fall-special-events.asp?i2s3 to see the schedule and description of all of the classes being offered and the special events at the conference, too. There will also be a shopping floor at the conference to buy new yarn, hooks, patterns, etc! Attending the conference is like being in “crochet heaven”!!! All the conference attendees speak the same crochet and/or knitting “language”! We all help each other and encourage each other in our crochet projects and classes! It is a wonderful experience! If you’ve never learned to do filet crochet, you’re really missing something wonderful! You don’t need to use crochet thread and a steel hook for filet crochet, either. If you prefer working with yarn, you can make filet crochet afghans. 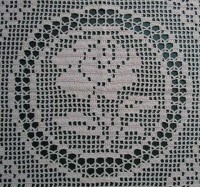 The technique remains the same whether you use crochet thread or yarn! I love filet crochet because I can see the picture forming before my very eyes (and I love working with crochet thread)! It’s easy to design in filet crochet, too. All you need is a pencil, eraser and graph paper to draw your design. That’s how I started designing in filet crochet. I now have a computer program that makes nice filet charts for publication, but that’s not needed if your project will be for yourself or given as a gift. There are many beautiful filet crochet patterns, also, that are fun to make. 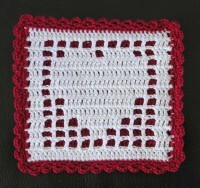 Filet crochet can be used for pillows, coasters, placemats, afghans, garments and much more. You can even use a filet pattern that was designed with thread and use yarn instead! Of course, the project will be much larger, but you may desire a larger project than the original size anyway! I think the Polish Stars technique is fascinating! I blogged about this technique on July 25th. If you read that blog post, you’ll see the before and after pictures of my Polish Stars swatch. The stars are formed when you weave the chain loops in the specified way. 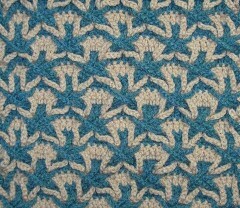 It’s really fun to see the stars take shape before your eyes when you weave them! Polish Stars can be used for many projects, as well. I’ll have a Polish Stars poncho on display at the conference in a special booth on the shopping floor from Thursday evening until Sunday afternoon. Please come by the booth and see a sample of this wonderful technique! 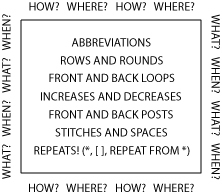 I’ve taught many students to read crochet symbols in my classes at past CGOA Conferences. They all love the versatility of crochet symbols and they now have the knowledge to make any project from just a symbol chart (even foreign patterns like Japanese and Russian). Since I love thread crochet, I have many Decorative Crochet and Magic Crochet magazines. All of these patterns are written with very little words, but with a fantastic symbol chart that is easy to follow, once you know how! I’m so glad that I learned to read crochet symbol charts years ago. It really opens up a whole new world of crochet once you learn! And I’ve learned to make crochet symbol charts with Adobe Illustrator, too! Since I’m “electronically challenged”, it’s sometimes a challenge for me, but with the help of my good friend, KJ Hay, I’m learning more about Illustrator all the time! Thank you very much, KJ! If you’ve never seen Intermeshing (aka: Interlocking) Crochet before, you’re missing something really cool! You can create reversible crochet fabric with different looks on each side! The photo shown here is actually 2 sides of the same piece! I’m a real “geometric” person, so Intermeshing appeals to me a lot! I love anything that isn’t “ordinary” crochet and gives me a challenge! You won’t find me with mindless crochet projects very often!!! If you’d like to read more about Intermeshing, please read my blog post on May 25! 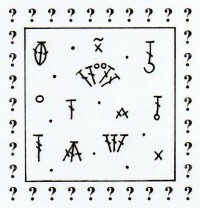 You’ll find a link to a wonderful Intermeshing/Interlocking book there, too. I don’t know how anyone progresses in crochet without knowing how to read a crochet pattern! I’ve learned a lot about reading, writing and editing crochet patterns over the last 3 decades and I’d love to share that knowledge with you in this class. If you’ve ever struggled with reading or understanding a crochet pattern, this class will give you the knowledge and confidence to push yourself further in your crochet projects. Once you learn to read a pattern with ease, you’ll find yourself crocheting projects you never thought you could make before! If you’ve signed up for one of my classes, thank you very much! I look forward to meeting you in my class and/or at Professional Development Day in Reno. For those of you who are on the fence about what classes to take, I would like to “encourage” you to sign up for one of my classes. For whatever reason, I have low enrollment in my classes for the Reno conference, which puts some of them at jeopardy of being cancelled. I love teaching crochet and would be thrilled to have more of you in my classes. I’m very friendly and encouraging to all of my students. I strive to have fun, enjoyable classes for everyone! Thank you for your consideration of my classes and the Reno Conference. For anyone who hasn’t decided about attending the Reno Conference, please make the decision to attend the conference. It is so enjoyable to be around like-minded people who love to crochet and learn new crochet techniques for almost a week!!! I’ve heard that if the Reno (west coast) conference isn’t well attended, the conference probably won’t return to the west coast for a while. It would be a shame for those of us who live on/near the west coast to lose having the conference close to us. My classes at the Manchester conference in June of this year were very well attended, as was the whole conference. Please, let’s rally together and make the west coast conference as well attended as the east coast conference! I look forward to meeting you in Reno! This entry was posted in CGOA, Conferences, Crochet technique, Teaching classes and tagged CGOA, classes, conference, crochet, filet crochet, teaching. Bookmark the permalink.